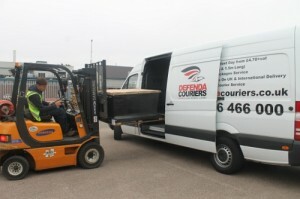 Same day Courier in Coventry — Fast Same Day Delivery of Parcels, Pallets & Loose Loads. Reliable and secure express delivery of your products with GPS tracked vehicles and instant electronic proof of delivery on our UK same day courier deliveries — CRB Checked drivers (now DBS checked). Call us now for a same day courier quote. Palletised good delivered Same Day / Next Day or Any Day, International pallet deliveries also available. Defenda Transport & Logistics Ltd — Reliable Coventry Same Day Couriers & Road Haulage. We are the perfect Coventry Same Day Courier for when you need to get an urgent package, pallet or large item from Coventry to another location in the UK on the same day. Defenda Couriers provide a Fast Response efficient Sameday Courier Service, with dedicated vehicles suited to your particular requirement. Small packages, documents, single or multiple pallets can all be carried in a dedicated vehicle — where pressing deadlines prevent the use of an overnight service. Be secure in the knowledge that our drivers are Criminal Records Bureau (CRB) checked. We strongly believe in providing the lowest prices to our customers, helping them maintain a healthy margin and not being forced to watch their profits disappear in transportation costs. Building long term working relationships based on volume and reasonable prices has proved a successful formula for our same day courier service. It is a formula we intend to continue and expand as the company continues to develop. Our 024 76466000 number will forward to our out of hours number after 5.30pm — so whatever time of day or night it is — you can always secure an emergency same day collection or delivery. During normal office hours you can simply email: quotes@defendacouriers.co.uk. Over 10 years of transport and logistics experience. Professional and personal service tailored to your needs. Full range of services, Parcels, Pallets, Packages i.e. Documents, Same-day, Next-day delivery services, International deliveries, Freight Forwarding, Sea Containers. We can same day courier your documents and parcels from Coventry and surrounding areas to almost any UK & many mainland European destinations or overnight worldwide at massively discounted rates. Due to the volume of domestic UK and International parcel traffic we handle, we can pass on fantastically low rates to customers. Unlike many parcel couriers, we offer very generous weight and size allowances. Standard UK parcels can weigh up to 30kg with no single dimension exceeding 1.5m. We can of course carry larger items but they will fall outside our standard tariff which can be found here. Below is a guide to just some UK cities & towns and the services available as standard parcel services. i.e. next day delivery, two day delivery (two working day 48hr service), same-day courier delivery and three day delivery.